President Harry Truman was outraged by the incident. He established the first presidential commission on civil rights and his Justice Department filed criminal charges against Shull. In July 1948, following his commission’s recommendation, Truman ordered an end to segregation in the U.S. armed forces. An all-white South Carolina jury acquitted Shull, but the presiding judge, J. Waties Waring, was conscience-stricken by the failure of the court system to do justice by the soldier. Waring described the trial as his “baptism of fire,” and began issuing major civil rights decisions from his Charleston courtroom, including his 1951 dissent in Briggs v. Elliott declaring public school segregation per se unconstitutional. Three years later, the Supreme Court adopted Waring’s language and reasoning in Brown v. Board of Education. 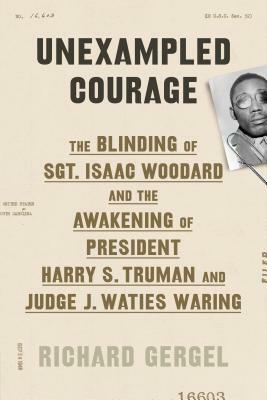 Richard Gergel’s Unexampled Courage details the impact of the blinding of Sergeant Woodard on the racial awakening of President Truman and Judge Waring, and traces their influential roles in changing the course of America’s civil rights history. Richard Gergel is a United States district judge who presides in the same courthouse in Charleston, South Carolina, where Judge Waring once served. A native of Columbia, South Carolina, Judge Gergel earned undergraduate and law degrees from Duke University. With his wife, Dr. Belinda Gergel, he is the author of In Pursuit of the Tree of Life: A History of the Early Jews of Columbia, South Carolina.